But I was plagued- how would I do this and be unique? You know me- I gotta be different! I was bemoaning this very thing to my gal pal while we were out junkin’ one day. And like a beacon from the upcycling deities, my eyes fell upon a beat-up vintage wooden tennis racket. This! I could cross-stitch on the racket head! And it was cheap… less-than-a-bottle-of-water-at-the-gas-station cheap! After hitting a few more thrift stores, I was set- vintage tennis rackets are pretty easy to find these days! This post contains affiliate links for your crafting convenience. Is cross stitch on a tennis racket considered DOUBLES?? And yes, I’ve saved the handles for another project! Curious about the handles? This is what I did with them! Anyway, I was ready to do some Christmas cross-stitch on my vintage tennis rackets, but I had no patterns. I’m a complete novice when it comes to this kind of needlework, and I had no idea how to design my own pattern- particularly on my large-scale tennis grid. What’s a girl to do? Well, I turned to one of my blogging “Sheroes”, Bev from Flamingo Toes. NOW I could get my Christmas cross stitch on! First, I painted one of my vintage tennis rackets midnight blue, and purchased some chunky yarn. Chunky yarn will be perfect! I used painter’s tape (like this kind!) on one end of the yarn (like an aglet on a shoelace) to help ease the yarn through the strings, and it worked like a charm! And just like that…we have cross stitch! I followed Bev’s awesome pattern and cross-stitched along. I stopped and started new yarn periodically so that there were no long stretches across the back (which could be seen through the strings). That kept it clean-looking, and I would weave the tails carefully through the back stitches (or use a dab of hot glue to keep it in place). And then I was done with my first Christmas cross stitch (the snowflake)- how FANTASTIC is that?? Super easy, super amazing, and I love that the racket acts like its own frame. 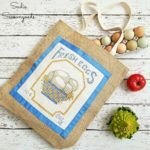 Cross stitch that only takes minutes to complete! I went ahead and made a couple of others, including the tree I told you about earlier and a Poinsettia (one of the patterns on her page!). I mean…look how cute that tree is! Proof that every racket doesn’t need spray paint! Then it was time to display my Christmas cross stitch results on vintage tennis rackets! I cut the racket handles with that little “nub” on purpose- in case I wanted to add a D-ring or sawtooth picture hanger to the back. But for now, they’re just resting on our quirky-weird Christmas mantle. Amazing, right? And super bonus- you can usually find vintage tennis rackets at your local Goodwill or other thrift store. I won’t lie to you, I’m quite tickled at how they turned out. There were moments of worry and self-doubt, but Bev bolstered my spirit and kept me going. Thank goodness for bloggy friends! Before you go, please check out my full collection of repurposed and upcycled DIY Christmas projects for even more cheerful inspiration! Merry Christmas and Craft On! Oh my goodness, Sarah. These are the best! This is a post waiting to go viral. If it’s not already on HT, it should be! You have given me an awesome idea! My nephew plays Tennis….so I started imagining his name or a term from tennis on a tennis racket. But….yarn didn’t seem to be the right thing……I’m wondering if I can use bungee cord? Of course, now comes the part about how to map that out. Thanks…..love the idea! Good idea about paracord! Thanks! Oh my gosh, I can’t wait to try this. Thanks! You so SMAHT! Dayum! I woulda never thought of that, but it’s amazing! Hmmmm, now where in the barn did I stash those ol’ rackets…. *wanders off muttering to self like the crazy ol’ cat lady I am…. HAHA, love it, Denise!! They turned out cute, right?? Way, way beyond cute! Gawjus! So different, unique and vintage! Love the old racket look with an old stitching pastime of mine. Yours came out perfect! Sarah! This was so much fun and I love how the rackets turned out! Merry Christmas! Thank you for everything! We are SO collaborating again- Merry Christmas!! What a fabulous and very unusual idea! You’re makin’ me blush! 😉 Thank you, sweetie! Thanks, Rebecca!! I sincerely appreciate such sweet words- happy holidays to you! Beautiful! And totally surprising project!!! You never disappoint with your creativity! Thank you for linking this up to Welcome Home Wednesday! What an great idea! Love this! I love this idea! Very, very cute. This is a fantastic idea! These would make a great gift for my mom next year! Thanks for sharing. Oh goodness!! These are absolutely fabulous! So unique!! I LOVE these! So clever!! Cute idea! I am crushing on all of the cross stitch projects I see on Pinterest too. What a creative spin on those! Thank you for sharing at Merry Monday! This project is beyond cute – and amazing – and clever. I’m speechless! You freak me out a little – in a totally good way lol – I just can’t believe the things you come up with – you’re pretty incredible !!! What a cute repurpose! I think I’d even like them with the handle. Thanks for bringing this by to Throwback Thursday! I’ll be pinning to our board. Oh my goodness, these are so adorable! What a great project! Thank you for sharing with us at Create • Share • Inspire, we hope to see you back this week! Fantastic idea…………….we like it very much!! I just got into cross stitching and totally love these!! What a fun idea! Love those vintage rackets and great source for your cross stitch designs. Thanks for sharing on Funtastic Friday! These are so stinkin’ cute and original! Love them! These turned out so fabulous! I love that you have repurposed some old rackets and given them such an awesome new lease on life! So clever!!! Thank you so very much, Sam! This is beyond clever and adorable. Thanks for sharing it with us at the Waste Not Wednesday Link Party. So very true- thank you, Amalia!!! These are incredible and so creative! I love cross stitch, so I can really see doing these! Thank you!!! Thank you so very much! They’re such a breeze to do, too!